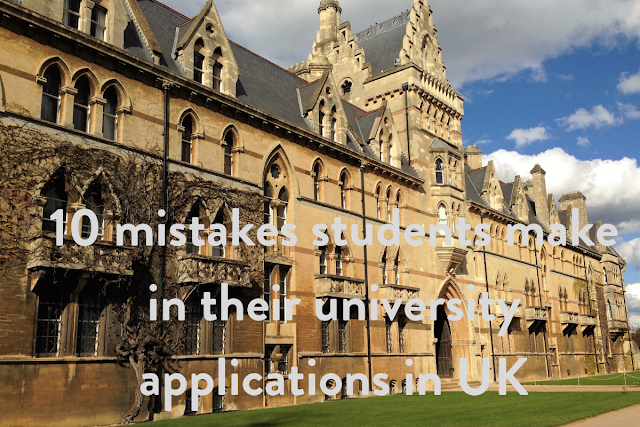 During working and analyzing university applications in the UK for international students applying to British universities, its notice that some mistakes happen way more often than others. so today we would like to share 10 most common mistake that students make in their university application. The first mistake is applying to only one university or way too many. First of all don't put all your eggs in one basket even though you might need all the answer requirements for the University. It still doesn't guarantee you a place on the course. After all if it is a competitive program it might be oversubscribed, because all universities view away their offers on the first come first serve basis. What is recommended? Answer is if you're applying for a bachelors course then choose five programs because you submit one application to all five universities but if you're a master student then choose a maximum three programs. You need to send a separate application for each university plus you need to amend your personal statement for each program and each University. Takes time and high quality here is essential. Poor planning, we all very busy and it's so easy to procrastinate but university application it's been only place and all the time where lastminute.com doesn't work you have to plan in advance. British universities do have very strict guidelines especially for bachelors programs so if you're a bachelor student then ideally you should start your application one year in advance. when the system you are going to apply called you cut open, that's especially important, if you're flying from methane or all British universities because for those the deadline is 15th of October and year before the program starts the headlines are so insane here. Filling up the application form of university. Many students fill sloppy and careless information on application which create the worst impression about the student who submitted the application. It is recommend that you do take your time and carefully fill every field in the application form. Read every requirement and provide every single document in the format required if something is unclear do call the university and ask or if for example you have a document in a different format then make an explanation note why it so so takes your time. Getting too personal in your personal statement it sounds all right, but this is a prevalent mistake. Many students get into giving away way too much personal information that's not even related to their course. So don't share your childhood stories concentrate on your current achievements skills, talents and ambitions also don't share your grandma's favorite saying, tell them what do you think. Being shy is probably the biggest mistake you can make. A lot of people feel really awkward telling others how brilliant we are. sometimes really wrong about blowing your own child back but university application this is the time when you forget about your shyness and just go for it. you need to tell in detail about each of your achievements what you've done what you've learned but made sure that you support each of your claims by specific evidence, in this case, it's not just those things that are merely stating facts. Being scared or being different, it is noticed that the majority of students before they write their personal statements. Go online to read a few examples, and that is a good start it's a great way to learn how to write them what to put in them, but there is also a risk that your personal statement will end up sounding like thousands of others. Don't be afraid to write something different to be original and to be yourself because if you are applying for a competitive course and many students meets academic requirements the personal statement is one of the few ways to stand out. The lack of extracurricular activities can they costly for your application. Some students concentrate on the academic side of things too much, and they just forget to tell how brave we are outside the classroom. tell them what are your hobbies and talents maybe you play a music instrument, or you went a photography exhibition or only the last summer you took part in a challenging hiking. share this experience universities really love well-rounded students who can bring in something you connect with other people. these qualities and make you to most significant. Being funny is a mistake funnily enough, don't get a drawing hair funny. Is good it's excellent inside but being funny in your personal statement or anywhere else in your application is very tricky if the person who is checking your application doesn't get the joke or doesn't share the same sense of humor then it might backfire. And it seems that it's especially true for international students as cultural differences aside from the humor soft and unless you're hundred percent sure that you've built your joke is dude and university will get it just leave it out. Under estimating references is a big big mistake when you say you're great in your personal statement is one thing but it was another person center. you're great in the reference it's just entirely different it has much more impact especially if this person is a respected professor or a manager of a company. it notice that many students are happy to get a reference from the top person who tells me yet to write in a few definite lines about them. But that is not good enough you need to find the person who knows you well and who is willing to put time and effort into writing a useful reference, not a generic one. The last mistake is using informal email address most often students provide very funny or strange email addresses in their application form it can be jonny007@gmail.com or sweetheart@yahoo.com and something like that, these are the worst one. we all have a funny email and we use it to send pictures, messages of cute puppies, movies etc to friends but we should also have working one too, but also official personal email and then use the one which is appropriate in the situation so you should do the same and it only takes five minutes to open a new email box we must say that University would not reject your application because of a silly email address but it doesn't make a cool impression.